A bigger threat then the Sith? Instagram. That gizmo is forcing people to take great photos and wreck 90% of them with 'retro' filters. Fads burn out people, but memories are forever. Still every cigarette packet has a silver lining and the site does prove an awesome resource to see what's going down in the world at any given time. Star Wars Celebration VI was a massive convention in Orlando, Florida last week. One faithful force feeler snapped on Instagram, thought it would be the perfect time to show off his jaw-droppingly cool (but probably single-life inducing) Sithful skin-art. that just rocks! as far as i can see he doesn't have any skin art from the prequels thank goodness. only art from the era where idolizing Lucas was considered normal. any fan boy who idolizes Lucas now is pretty pathetic even by fan boy standards. I can't even think of a scene from the prequels that deserves ink. Well, apart from Ewan McGregor. But that's a separate issue than Star Wars. 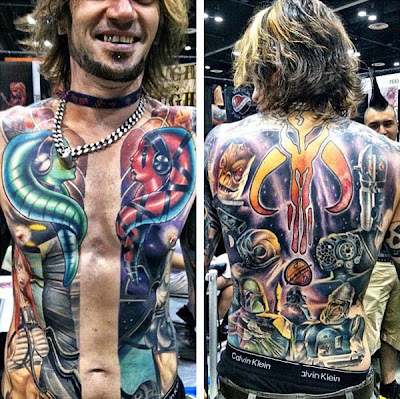 That is, apart from a sterling example of Star Wars Fandom, some excellent tattoo artwork. I wonder, though, exactly what he's saving that strip down the middle for? A lightsaber? Glad you liked it Dave - that would've taken some time under the needle to get that level of colour and detail! Random I have one word for you. Vader. Everyone knows Star Wars ain't Star Wars till theirs a huge Vader image somewhere. Or maybe Chewbacca. Everyone loves a Wookie! just a heads up mate it's nothing quite this elaborate but i've got some great new fan art on the ROM blog coming up at the end of this week that will lead into some more featured stuff early next week. Oooh. I love a good teaser. Womder if he will get a Han Solo tattoo on his todger? sounds good to me Dave! Karl I think if he did that he'd become more of a'hand solo' for life - but stranger things have happened! My last tattoo I had a conversation with the artist about the things people got tattooed "down there." I still can't get the visions out of my head. yeah I've heard of it before but like all other wartime torture chamber techniques, me and my pain threshold are happy to deny all knowledge!